purified Masonry by persecution, and so proved to be its benefactors." 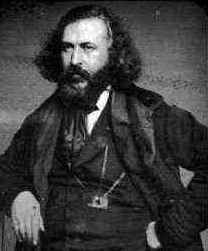 Albert Pike (1809-1891); "Morals and Dogma"
No discussion of anti-Masonry would be complete without an extensive mention of Albert Pike. The flyleaf of a biography written by Mason Jim Tresner describes him as "...a pioneer, a crusader for justice for Native Americans, a practical joker, a reformer, a journalist, a philosopher, a prominent Washington lawyer, and a Civil War general." For many years, he was leader of the Scottish Rite in the southern United States and he was the author of Morals and Dogma published in 1871. The title in and of itself has led to much confusion since those who are NOT Masons seem to assume that his book sets forth 'dogma' for Freemasonry. Nothing could be further from the truth. Let's clarify right at the outset: the vast majority of those who become Masons have no idea whatsoever who Pike was. In fact, most Masons throughout the world become members and will eventually die without ever encountering either him or any of his works. Of all the Masons world-wide, it's likely that fewer than 2% will have ever even SEEN (much less read) a copy of ANY of his hundreds of writings, most of which have been relegated to the dustbin of history. Of the few who have, what they're familiar with - almost without exception - will be Morals and Dogma, a book that anti-Masons delight in holding up as the 'Bible' of Freemasonry. The reason this book seems important is two-fold: first, it was found in a number of Masons' homes (as explained in the next paragraph) and second, because it had something many books of its day did not: an exhaustive index. It was NOT important because it was a 'guide' or 'rulebook' of any kind in Freemasonry. It was, simply, the sometimes jumbled thoughts of one man. The Morals and Dogma of Freemasonry? NO! For about 60 years Morals and Dogma was given as a gift to all who joined the Southern United States jurisdiction of the Scottish Rite. The Scottish Rite is an appendant body of Freemasonry. It is NOT Freemasonry itself! While all Scottish Rite members are Masons less than 25% of Masons have ever been Scottish Rite members. When the Shrine was formed right around the time of Pike's death, being a member of the Scottish Rite was a requirement to join the 'Playground of Freemasonry'. In the United States, the SR degrees were offered in a theatre setting over the course of as little as one or two weekends so those those who wanted to become Shriners would join the Scottish Rite rather than joining the York Rite which would take much longer. Consequently these books wound up in a number of houses where they would sit on a bookshelf for decades - unread. In the earliest printings there was an instruction that it was to be returned to the Supreme Council in the case of death of the owner. This request was not because the book contained anything of a secret or concealed nature. It was simply because books were expensive and this 'recycling' (at a time long before that word became part of our lexicon) kept costs down a bit. Of course there was no way to enforce that request and in a majority of cases it was unknown or ignored. (Hey: if the book wasn't read, nobody would have seen that request!) As book publishing costs came down, later editions did not contain that request. There have been those who've suggested that this REQUEST was for some nefarious purpose but the reality is that it was NOT an 'order' in any way and was quite impossible to enforce. It also ignores the reality of the times. We'd guess that of the few who actually begin reading this ponderous 850+ page tome only a very small percentage actually finish it. Of those who do finish it, the great majority will admit that they could barely understand it. (Lately, with the advent of various book comparison online venues, it would seem that far more NON-Masons have read the book than Masons!) Despite the fact that only a miniscule number of Masons have read this book (and then, only those who read English! ), anti-Masons and the unknowledgeable continue to claim that Pike and his works exert significant influence over Freemasonry today. Let's be clear: the book was NEVER given to all Masons and it has NEVER, EVER (not once, anywhere, anytime - can we say NO in any other way?) been used as a 'textbook' or 'instruction' for Freemasons. Morals and Dogma is a philosophical work, created by an individual who was an extraordinarily prolific writer even for an age when prolific writing was the norm. It was also fashioned in the style of Pike's time when public speaking was a high art form and Pike was known far and wide for his skills in this area. Morals and Dogma is not a manifesto (i.e. public declaration of principles, policies, or intentions) for Masonry or even for the Scottish Rite's Southern Jurisdiction. It is, rather, an attempt by Pike to provide a framework for understanding religions and philosophies of the past. Pike believed that without knowing the history of a concept, one couldn't grasp the concept itself - and thus his lengthy explanations of various religious beliefs, consistent with knowledge of those beliefs in the mid-1800s. And it's NOT a matter of this book being relevant in "one jurisdiction and not another" as some religious intolerants sometimes claim: this book was NOT written for ANY Masonic jurisdiction: it was written for a totally separate organization in which less than one quarter of Masons have held membership at any point in time. That Pike had the time, interest, and financial ability (remember that well before he became a Mason he was a businessman and lawyer who had a pretty fair amount of what we today would call 'disposable income' and that he ultimately served as a General in the Confederate Army and more. He wasn't poor by any stretch so the writing of a book by a person who had money and a passion for reading/writing doesn't mean that his work is Freemasonry's doing. Interested in Pike's statement about "Lucifer" in M&D? Click HERE! Out of the next 100 men who join Masonry world-wide, less than 10 will obtain (either through purchase or from a library) Pike's Morals and Dogma. Now that it's freely available for free on the web, we doubt that these numbers will change in any way. It's just NOT that important to Freemasonry and nobody will mention it to the new Mason. Out of the 3 who actually finish, perhaps one will feel he understands it! It is a massive book and is certainly not 'light reading'! The index mentions essentially every word that Pike used in the book thus making it distressingly easy to find a titillating word or two. Taking quotes out of context is an entire cottage industry that has developed around this particular work. Because of the writing style used by Pike many of the explanations he seeks to provide about his thoughts on history, religion, philosophy, and more, are totally lost on current day readers. Pike felt that unless one understood the complete background of a philosophy he could never expect to understand any part thereof. As a result he tried to put everything he'd read, learned, or 'knew' into his prodigious writings. In the case of Morals and Dogma, it's sheer size alone keeps most people today from reading, much less understanding it. Don't believe it? Use our Reality Gauge and get a copy from your local library or from the web. Then READ IT! Don't just browse and look for offensive passages which you might find if you use the index; actually READ THE BOOK! We can pretty much guarantee that you'll not be that 1% who understand the darn thing - and even if you are you'll see that Freemasonry today is SO far removed from all of that turgid prose that it's incomprehensible as to why people would bother to quote Pike on ANYTHING! Grabbing quotes out of context (and this was, after all, his written discussion of various world religions and philosophies), it's quite easy to find things which will make Pike sound just awful. In context - and particularly when one considers that this is one book by one writer - Morals and Dogma simply has no relevance to the actions and activity of Freemasonry. And it should be noted that Masonophobes (anti-Masons) also ignore the hundreds of thousands of Masons who have explained - in books, talks, and on the web in videos, blogs, websites and more - that Pike's book is NOT any type of 'ruling guide' or 'handbook' for Freemasonry. How did Morals and Dogma gain such 'notoriety'? For many years, the Southern Masonic Jurisdiction of the United States' Scottish Rite gave those who received the 32nd Degree a copy of this book. It was a tribute to a man who had done so very much for their organization. For many Masons who joined after World War I or around the Great Depression in the US or during/after World War II, it might have been the only book they owned which related to Freemasonry! Hundreds of thousands of copies of this work were published and given away. They have collected dust on bookshelves for decades ever since. For those who sought to learn Freemasonry's supposed "secrets", this tome seemed to be a ready reference. A cover with an apparently 'Masonic' emblem; reference to "all" the degrees (so they thought), and a book which had been in their house since they were old enough to remember. A phrase was plucked from here and there - and suddenly Masonry was an all-encompassing satanic group in their mind. "Everyone is free to reject and dissent from whatsoever herein may seem to him to be untrue or unsound. It is only required of him that he shall weigh what is taught, and give it a fair hearing and unprejudiced judgment." Knowledgeable Masonic authors say these were the words of Pike himself but others aren't so sure. Regardless, the words appear in every copy so if a person claims that the OTHER parts of the book constitute some sort of 'rulebook' for Freemasonry, why don't they note THIS part which totally refutes that claim? How can one assume that Masons follow blindly everything else Pike 'taught' (he wasn't 'teaching' but that's another discussion) but ignore the two sentences that start the book? Today some Masons will diminish Pike's importance so as to deflect the charges of anti-Masons. Sometimes too it is noted that Pike never held an office in Freemasonry. For the record: Pike joined Freemasonry in 1851 and in 1855 (four years later) was the Master of his lodge. He also served his Grand Lodge as the Chairman of the Committee on Masonic Law & Usage and for a year held his highest office in Freemasonry: his Grand Lodge's Chairman of the Library Committee. 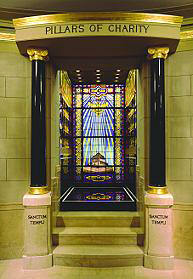 (For the record, even this site's author has held higher Masonic offices!) While these are important offices, they were at a jurisdictional level and NOT involving hundreds of other Grand Lodges worldwide. He received the Scottish Rite degrees from Albert Mackey and immediately undertook the task of re-writing them to provide a more organized series of lessons which would (ostensibly) impart knowledge. Again, this ONLY applied to the Scottish Rite Southern United States Jurisdiction. The degrees in the rest of the world (including the then more populous Northern Masonic Jurisdiction in the United States) were NOT re-written by Pike, once again reinforcing the fact that Pike did NOT rule Freemasonry - or even the entire Scottish Rite! Certainly there is no doubt that he may have been among the most influential Masons of his time. His size (both vertical - at about 6' 3" - and horizontal - weighing some 300 pounds) coupled with long, flowing locks and a thick beard - jet black in his youth and white in his old age, made him seem even more the giant of his time than he was. Possessed with the gift of a deep voice and exceptional oratory skills, he WAS formidable - and a person to be long remembered. He is today one of the names most well known but whether he was more important than others remains to be seen. It must be also remembered that this was a time when communications even with surrounding states was severely limited and travel from place to place took days. Pike wrote Morals and Dogma some eight years before Alexander Graham Bell transmitted the first wireless telephone message! Pike was a giant of his time who did extraordinary things in his lifetime. He was the ONLY Confederate soldier to be honored in America's capitol of Washington, DC, where a huge statue of him dominates a major intersection (Judiciary Square). See more about that here. While Pike was an extraordinary man, his writings are mischaracterized and the shadow he casts over Freemasonry today is, for all intents and purposes, inconsequential. His philosophical writings have been misquoted and used completely out of context to the point that today it is likely even he would not recognize them! Demonization is the name of the game that anti-Masons play with Albert Pike, including spurious charges that he was part of the Ku Klux Klan (KKK), a traitor to the country (because he served as a General on the losing side in the Civil War), and more! Anti-Masons too make much of the fact that Pike is actually buried within the 'House of the Temple' - the Southern Masonic Jurisdiction's building in Washington, DC. However, they never seem to get to the WHY of this supposed importance. The facts are that in 1944 and 1953, by special permission of the United States Congress, the remains of Sovereign Grand Commanders Albert Pike and, later, John Henry Cowles were placed in vaults to either side of the light well. Memorial busts of Pike and Cowles, each on a marble pedestal, were added at that time. Both men had made lifetime commitments to the Scottish Rite and it honored them accordingly. Those seeking to show some nefarious connection between Pike being buried there seem to have no explanation for - or wish to even acknowledge - that Pike was NOT so unique in that Cowles lies there as well. Recently, we found an interesting and informative essay titled "Venus, the Devil, Jack Chick and the Freemasons". We encourage you to read it here. It's pretty comical. We would encourage anyone interested in understanding Morals and Dogma to read 'A Glossary to Morals and Dogma' by Rex Hutchens as well as the informative book 'The Bible in Albert Pike's Morals and Dogma' by Hutchens and Monson. These titles are now somewhat hard to find but well worth the effort. 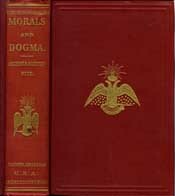 There is a 2007 book titled Morals & Dogma in the 21st Century by Kevin Main, Brian Chaput, James Miller, and William Goodell, a group of young Masons who've gone through Pike's original work and have provided modern interpretations and understanding. It's an intriguing work. There have been a couple of disparaging comments (there's no possible way to make a 're-telling' the same as the original, to wit the many attempts to update the Bible, but this does provide a very unique look from a modern perspective. You can also listen to a podcast done with the authors at the Masonic Central website or head to YouTube to see a video they've done. And if you really enjoy Pike's prose, you will certainly enjoy A Bridge To Light which has been the heir apparent to Morals & Dogma. It's available from the Scottish Rite here. 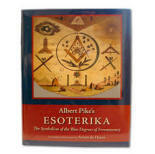 Pike's long out-of-print Esoterika edited by the Scottish Rite Southern Jurisdiction's Grand Historian Arturo deHoyos has recently been released to rave reviews. It too can be ordered from the Scottish Rite at this page. While you're there, you may wish to consider membership in the Scottish Rite Research Society. One of the best books about Pike and his life has been written by Professor Emeritus of History at the University of Arkansas in Fayettville. 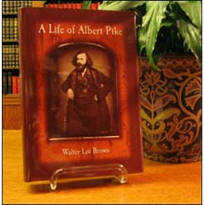 A Life of Albert Pike is available directly from the Scottish Rite at this link as well as from Amazon and other online booksellers. Note that the pricing for the book from the SR is considerably lower although we can't tell if perhaps this is a paperback compared to the Amazon selection, known to be hard cover. Either way, it's well worth the investment if you want to really learn about Pike, the man. 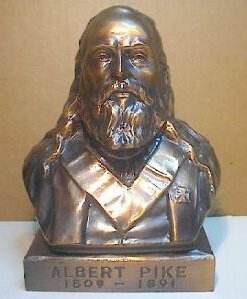 Some other good material related to Pike and the Southern Jurisdiction of the Scottish Rite includes Albert Pike: The Man Beyond The Monument. Written by Mason Jim Tresner, a long-time fan of Pike, this anecdotal autobiography will give you a REAL feel for the man. And don't forget to see other related reading material we've written about here.